"It's like she's not scared of anything." The role of "executive assistant" typically brings with it notions of making appointments and coffee runs. 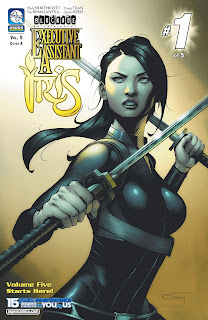 In Executive Assistant Iris Vol.5 #1 from Aspen Comics, that role also brings with it protection and fighting. The issue is written by Blake Northcott, illustrated by Donny Tran, colored by Omi Remalante Jr. (and Luis Guerrero) and lettered by Jaymes Reed. Northcott's approach in the issue refreshing in that it introduces the reader to Iris while also modernizing her in some ways. Iris is the original Executive Assistant and has seen her share of action, something Northcott acknowledges in a way by showing her unfamiliarity with changes to the game. It's nice to see heroes vulnerable and Northcott allows Iris to readily admit that the's not as spry as she used to be--the effects of age. Iris aside, Northcott also does some world-building by giving Iris a new purpose as an Executive Assistant, eschewing her retirement for the promise of better technology and tools in her role. Granted, there will surely be conspiracies and double-crosses down the line, both of which Northcott does an admirable job of setting up without entirely tipping her hand. Tran's pencils are very clean and concise. The style Tran relies on feels a little glossy at times, in that there's an animated sense to the players that detaches them somewhat from reality. That being said, Tran does a solid job keeping up with the action on page, effectively demonstrating the physique and combat prowess of Iris and making her believable as the best of the Executive Assistants. The panels are stacked and arranged fairly cleanly to better facilitate the reader's experience. And the colors by Remalante Jr. and Guerrero are vibrant and bold, very much fitting with the Aspen Comics style. Executive Assistant Iris Vol.5 #1 is a great return for a familiar character. Iris is contending with a world vastly changed from when she was in her prime, but that doesn't mean that she can't learn a few new tricks. Northcott's script is very fluid and enjoyable, bringing both Iris and the reader up to speed on the new world. Tran's illustrations are a great fit and effectively capture everything about Iris that makes her ruthless. Executive Assistant Iris Vol.5 #1 is worth checking out for fans of the series and offers a great starting point for new readers. Executive Assistant Iris Vol.5 #1 is available now.